The author shoots it out with two full-size DA round guns and two full-size autoloaders to see if he can answer this age-old question. When my older brother, an engineer in the firearms industry and an ardent shooter, is pressed to name his favorite type of handgun, he is fond of saying, "For the first six shots, the revolver is the best handgun in the world!" Maybe it has something to do with heredity because I will freely admit to having a soft spot in my heart for the round gun. To me, the semiautomatic pistol hasn't been built that displays quite the same level of ergonomics and "pointability" of a quality, medium-frame revolver. And the smooth, rolling stroke of a finely tuned double-action revolver trigger is one of life's great pleasures. But before I am accused of waxing too eloquently in favor of the revolver, let me come to the defense of the autoloader. As with my revolvers, I own quite a few pistols and use them for both competition and daily carry. Today semiautomatic pistols account for the majority of handguns sold for police service, defensive purposes, and competitive shooting. But the revolver continues to hold a significant share of the market, and sales of small, snub-nosed revolvers intended for concealed carry remain very strong. The round gun also dominates the hunting and silhouette shooting markets, and as action shooting organizations such as ICORE, USPSA, and IDPA revive revolver classes in their matches, it is experiencing new acceptance among competition-minded shooters. Revolvers and auto pistols have experienced ups and downs in popularity over the years, but there is still one question that keeps some of us awake at night: Which is the better handgun? I decided to try to answer that question by putting two double-action revolvers and two autoloaders to a head-to-head shooting evaluation. The editor, Joel Hutchcroft, requested that I restrict my discussion to one area: full-size defensive handguns. With that in mind, I made the following two lists of the requirements for defensive handguns. They must be utterly reliable. They must provide acceptable accuracy within normal combat ranges. They must be simple to operate. They must display good handling characteristics, especially recoil control. They must be chambered for cartridges with sufficient power for defensive purposes. They must have sufficient cartridge capacity for the job at hand. They should be of a weight that makes them convenient to carry for extended periods of time. They should be compact enough to carry concealed, with the right holster, under light clothing. They should have grips suitable for a wide range of hand sizes. They should be capable of accepting equipment making them suitable for specialized purposes. Extra ammunition/magazines should be convenient to carry. I selected those types of full-sized revolvers and pistols that have been most popular with police and civilian shooters. My choice of revolvers included an S&W Model 10 and a Ruger GP100. The former is a modern reincarnation of that company's century-old .38 Hand Ejector Military & Police revolver, probably the most widely used police handgun of the 20th century. Ruger's GP100 exemplifies the slightly larger revolvers chambered for the .357 Magnum cartridge that came into vogue before the meteoric rise of the auto pistol. The pair feature four-inch barrels, synthetic grips, and fixed sights. Any number of modern semiautomatic pistols would have been suitable for this report, and I narrowed my choices down to a 9mm Beretta Model 92 and a .40-caliber Glock 22. The Beretta features a DA/SA trigger mechanism and an alloy frame. The Glock uses the well-known Safe Action trigger and a polymer frame. While both of my test pistols came with pre-ban, high-capacity magazines, those sold on the civilian market today will come with 10-round magazines. I kept the test ammunition to two examples of the more popular loadings in each chambering. In .38 Special I chose the PMC 125-grain +P JHP and the CCI Blazer 158-grain +P SWCHP; in .357 Magnum I fired the Black Hills 125-grain JHP and the Federal 158-grain Nyclad HP. For the autoloaders, I chose the Cor-Bon 115-grain +P JHP and Remington 147-grain Golden Saber in 9mm and the PMC 155-grain JHP and Winchester 180-grain Ranger Talon in .40 S&W. To see how each handgun measured up (both to my expectations and against each other) I first fired each of them from a benchrest at a range of 25 yards. As can be seen in the chart, while the revolvers took honors in this stage of the testing, each member of the quartet proved more than accurate enough for its intended purpose as a defensive handgun. I think it is only fair to state that this pair of revolvers had single-action trigger pulls that were superior--light, short, and with very crisp letoff--to those of the autoloaders. It might also be relevant to point out here that while the revolvers were both new, out-of-the-box guns, the Glock and Beretta were well used, each having had many thousands of rounds run through it. But that being said, their trigger pulls had only benefited from this long use (they were well broken in). We should also understand that the basic designs of the two pistols' trigger mechanisms precluded them having single-action trigger pulls comparable to the revolvers. In fact, the Glock's Safe Action trigger has only one trigger mode with a short takeup and a rather heavy letoff. The Beretta, when fired in SA mode, had a lighter, crisper letoff than the Glock but actually had longer takeup. I then set up my chronograph and measured the velocities of each type of ammunition from its respective handgun. Once again the figures show that when fired from a barrel of at least four inches, the .357 Magnum still reigns supreme. Somewhat surprisingly, however, both the hotter 9mm and .40 S&W loads come darn close. I'm sure some shooters might use the muzzle energy figures to state that the .38 Special is at best a marginal load for defensive purposes. While there is no denying that modern 9mm, .357, and .40 loads produce higher numbers, it should be kept in mind that several of these were only obtained with increased levels of recoil and muzzle flash--both of which are detrimental to accuracy and fast follow-up shots. Shooters who have problems handling recoil should keep in mind that the only shots that count in a real-life defensive situation are the ones that hit the target. To put it bluntly, would you rather hit your opponent with a .38 or miss him with a .357/.40? For decades the .38 Special 158-grain lead SWCHP (the "FBI Load") was the choice of hundreds of police agencies across the nation and performed its job quite well. I would never feel under-gunned carrying a .38 Special revolver loaded with them. Because accuracy testing has limited application to a handgun's true "combat" effectiveness, I ran each handgun through the following series of offhand drills on a pair of IPSC targets. For this part of my evaluation I used holsters supplied by Don Hume Leathergoods, Uncle Mike's, Bianchi, and Hunter. I also made good use of HKS speedloaders for the revolvers. Each drill began with the handgun holstered and the shooter's hands by his side. Five yards: Perform "Two & One" drill (two rounds in the body, one in the head) on each target. Perform reload and repeat. Ten yards: Repeat drill No. 1. Fifteen yards: Fire three rounds on each target, rapid fire. Perform reload and repeat. Twenty-five yards: Fire three rounds on each target, slow, aimed fire. For the purposes of comparison, each scoring zone was assigned a number of points: A: 4 points; B: 3 points; C: 2 points; D: 1 point. While some may question my reloading of the pistols when they still held ammunition, I did it this way simply to gauge the difference in reloading time between the semiautomatics and revolvers. No one can argue that with high-capacity magazines the Glock and Beretta could have performed these drills without the necessity of reloading, but since most civilians today are restricted to 10-round magazines, their pistols would not have held sufficient ammunition to complete the drills without reloading. All four guns were simple to load, fire, and operate. And they proved to be 100-percent reliable--not a single failure to fire, eject, feed, or cycle out of the hundreds of rounds fired. That such reliability seems the norm today speaks volumes about the quality of manufacture. I should also point out that while the four guns had three different trigger mechanisms (DA revolver, DA/SA pistol, and Safe Action pistol) no mechanism provided any real advantage. I figured the score fired with each handgun: S&W Model 10: 147; Ruger GP100: 137; Beretta 92: 142; Glock 22: 132. The difference between the four handguns was minimal, but it should be noted that the two softest recoiling handguns--the Beretta and the S&W--provided the highest scores. After completing these exercises, I had a better idea of each handgun's strong and weak points. The Glock has good recoil control and simplicity of operation, but a set of coarse sights hindered accurate shooting beyond 15 yards. The Ruger GP100 had very good sights and a rather decent DA trigger. Its negatives centered around the heavy recoil of the .357 cartridge, which greatly hindered rapid fire. I enjoyed shooting the Beretta 92. It has good sights, light recoil, and a very decent trigger. Unlike some of the breed's critics, I had no trouble transitioning from DA to SA trigger pulls, but the grip was large and the trigger reach was rather long, both of which could be problematic for shooters with small hands. What can I say about the S&W Model 10? It's a classic, and the newest version was the best handling of the lot. I was impressed with the DA trigger, and the sights were easy to use. Recoil was very easy, which helped the Model 10 win in the scoring department. But as with the Ruger, the Model 10 was hindered by low cartridge capacity and slow reloading. Finally, to see if these full-sized handguns qualified for concealed carry, I donned the lightweight vest I normally wear in warm weather and had my photographer examine me for "signature" as I stood, bent, and leaned in various poses. With the proper holsters they could be carried completely concealed. Over the next month I wore each handgun/holster combination for a week. While all four would have served for concealed carry, I must confess--and this is a purely personal observation--that the size and weight of some of them became problematic after several hours. In general the lighter the gun, the better suited I found it and have to admit that the Ruger GP100 and the Beretta 92 (when loaded with a high-capacity magazine) were a bit of a burden. For regular concealed carry my choices would have been either the S&W Model 10 (which, in this role, would benefit greatly from a smaller set of grips) or the Glock 22. After evaluating these four handguns, I find it no easier to declare a winner than I did before I started the process. Any of them would be an excellent choice as a defensive handgun. Obviously, depending on a number of variables, under certain circumstances some would be better choices than others. While I was able to shoot the Model 10 more accurately than the others, the Glock 22 was the most comfortable to carry concealed. The Beretta's sights and grip shape were aids in shooting comfort, but the GP100's .357 Magnum chambering turned in the most downrange power. This test confirms what responsible shooters have been saying for a long time. 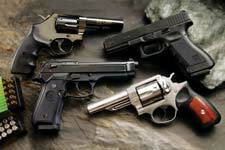 Determining which type of gun is best is an individual exercise. Each shooter needs to put each type of handgun through his own range test to find out which gives him the optimum combination of firepower (the number of possible shots) and accuracy. Hopefully my experiences will provide a starting point from which you can begin your own evaluation.